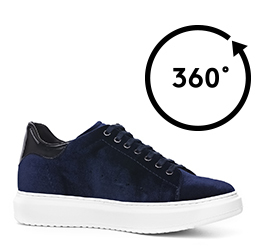 Handcrafted elevator sneaker in dark blue velvet and tone-on-tone patent leather detail on the heel tab. The comfortable natural rubber sole ensures maximum comfort. With its stylish and dynamic design, it is ideal to wear with jeans or fabric trousers. The inner elevator system increases height by 2.6 inches(6.5 cm) in total secrecy.